It has been 12 days since I have started my physical and spiritual journey. On June 29th I posted a blog called “Welcome to My Struggle”, where I recorded a very personal reflection on the state of, not only my waistline, but an idol that I worshipped. These days have contained discouragement, victory, and periods of waiting. Yes, I know 12 days is not a lot, but God has really spoken to me during this time. I would compare it to a different type of fasting in which God has been able to take control and lift the fog that was clouding my heart and mind. So far, I have learned 4 things as I have been in this process. 1. Hunger doesn’t always mean I am hungry– We all know that sometimes it is easy to raid the pantry or give in to tempation because we may be bored or something just tastes good. Over time, as I innocently gave into the idol I worshipped, the control I thought I had was given over to something inanimate. An object that has no personality or thoughts was controling the way I thought and functioned. I believe God desires more from me. 2. It’s okay to want something and not get it– This is a hard lesson for many people to learn. I can’t tell you how many times I would have sold a kidney on the black market for a piece of cake or a doughnut, but each time I said no I felt like I was taking control away from the enemy and allowed the one who created my body to do what He intended for me. I believe God will provide. 3. A serving size is enough– When I started making a plan for eating and snacking at work, I knew that almonds were going to be a good choice for me. They are a healthy snack, and quite tasty. The first few days, I missed somthing very important…16 almonds is a serving size. Did you know that? 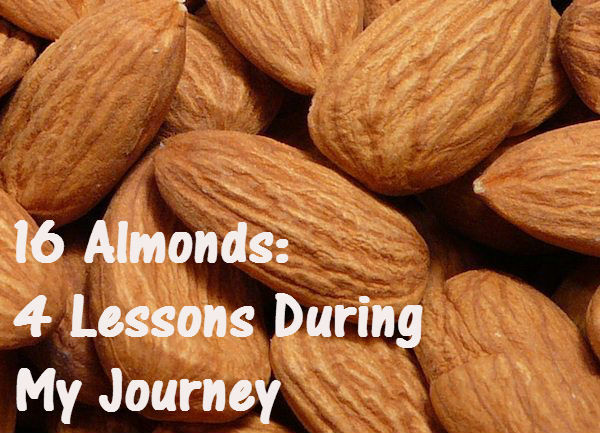 16 measly almonds is how much one person is supposed to eat…then stop…in one sitting. I don’t like that…I want to keep eating until I feel completely full, but…16 almonds it is *sigh*. I think this teaches me a lesson. Sometimes I think more and more and more is barely enough…sometimes I think too much is almost lacking. I always want to fill the void with other things other than what I know the truth is. More almonds will be there later. So, I only eat 16 almonds. I have “almond time” 2 times a day. I have learned to be content with that, and I am loving it. I believe God can be trusted and His way is right. 4. Darkness makes me hungry– I have learned to not eat before I go to bed. This is because the hunger will never end if this beast is appeased. Traditionally, I have had massive cravings for sweets in the evening…the idol was worshipped more at night than any other time. There is something to think about here. In darkness sin multiples. This is because sin is easy to conceal when the lights are out…figuratively. The problem is sin doesn’t happen in darkness necessarily, but actually brings the darkness. Then the offender feels alone and a deeper hatred for oneself occurs. I believe God wants me to declare victory! The first few days were very hard, because my habits kept begging me for a second chance. They have had their chance and they did not bring fulfillment. It is time to embrace enough, and continue to run after Jesus! More to come. Keep praying! 7 lbs down so far. 16 almonds doesn’t seem like much for a serving.